Almost 20 years ago, another mind-blowing sci-fi epic was released that encoded deep philosophical underpinnings — the Matrix. It’s a trilogy that can be viewed as big budget Hollywood thriller but also seen as representing or personifying philosophical arguments. The new Marvel movie Black Panther can also be understood in this light. It works as a big budget Hollywood movie with thrills galore. But the movie is much deeper than that. I hope to briefly outline now how the movie functions as such, but with the caveat that this is only a working draft that I will return to occassionally when I have more time to flesh out my thesis. I argue that writers Ryan Coogler and Joe Roberts Cole created an interpretive framework by which we should examine and explore Black Panther. It is obvious that Black Panther is a comic book story with a history spanning over 50 years. This is no revelation. The movie can solely be enjoyed on this level, but there are two other levels by which the story can be examined and analyzed. I believe if the other two levels are not both utilized, it strips the story of its full and fertile meanings. When digging deeper into the movie, it becomes clear that Wakanda as a political entity and Killmonger the character represent clashing ideologies about Black Liberation. On one hand, Wakanda stands as a non-interventionist state that hides its technological advancement from the world. Although it has spies in every nation, it has not held any imperial ambitions. On the other hand, Killmonger functions as a stand in for Malcolm X’s invocation “by any means necessary” and revolutionary approaches to defeating white supremacy militarily. Defeating white supremacy militarily may be a rarity, but it has happened before — particularly with the Haitians’ victory over the French plantation and colonial regime on January 1, 1804. Killmonger represents this revolutionary component which rightfully expresses a thirst for freedom for Global Africans strewn throughout the Diaspora. This connection is further made with the quick references in the film to the Black Panther Party for Self-Defense (founded in Oakland in 1966), the 1992 Los Angelos Rebellion in response to the police not being judged guilty for their beating of Rodney King, and the poster of Public Enemy’s album It Takes a Nation of Millions to Hold Us Back. But Killmonger is also wounded and enraged Black man who was willing to kill a Black woman (presumably his girlfriend) in his blood-thirst for power. After he becomes king, he proceeds to viciously choke a Black woman who is tending the garden. He has little use for the council of elders. Here I think Killmonger also represents both a type of brutal misogynist that is often found among some Black men in the Black nationalist community, the ones that put race issues first at the expense of the equally regarding Black women. As such, Killmonger represents a sexist Black nationalist ideology, but also a form of strategy (as organizations are built and operated on this premise) that renders Black women’s issues as secondary, demeans and disregards Black women, and posits Black men as sole leaders and messiahs for the race in the Black Freedom Struggle. Wakanda, in contrast, pursues its objectives with Black women serving as the equal of Black men while also showing Black women as saviors, warriors, healers, and scientists. Interestingly, Nakia represents and articulates a third strategy for defeating global white supremacy — Wakandan aid, education, STEM, and community development. Shuri is a major part of this strategy as the chief scientist and STEM genius of Wakanda. King T’Challa adopts Nakia’s strategy at the end of the movie as he purchases real estate in a disinvested, redlined Black neighborhood in Oakland, California and plans to open learning academies where Wakandans would share their technology and use it to educate and aid Global Africans. Nakia also represents a Black woman who calls on King T’Challa to provide aid and assistance to faciliate Global African community development. She does not want to move back to Wakanda (to marry T’Challa) until he is in alignment with what she describes as HER calling — providing aid, science, technology, and assistance to advance the Black Lives of Global Africans whether in Northern Nigeria or Oakland, California in the United States. Nakia represents the synthesis of strategy between violence and non-intervention as well as a fully equal and complementary partner to T’Challa (i.e. not as a subservient wife who will tolerate misogyny or disrespect). What drew my attention to this was the scene where the Queen Mother Ramonda, Nakia, and Shuri all invoke the Ancestors to essentially resurrect T’Challa. In the Ausarian/Osirian Drama, Set and Osiris are brothers. Set kills Osiris and dismembers him. Isis, who is the wife of Osiris “remembers” him and performs a ritual to raise him from the dead. T’Challa goes into a type of death or deep sleep when he is found in the snow and in a coma. Essentially then, he is resurrected with the aid of the Ancestors and the Vibranium herb that was kept by his wife-to-be Nakia. Unlike more Western modalities of spiritual thought such as Judaism, Christianity, and Islam, ancient Kemetan spiritual thought was neither rigid nor Manicheistic is its portrayals of its gods and goddesses. Although Set is a murderer in the Osirian Drama, the ancient Kemetans embued their myths with multiple layers of meaning. The Osirian Drama encoded everything from the science of astrology to the myths associated with “ages” of their Great Year to the ideas about the spiritual nature of human beings. The myths grew and changed over time, neither remaining static or dogmatic in interpretation. A god or goddess could be venerated in one age and deemphasized in another age. For instance, the god Set would have been venerated in the Age of Gemini (i.e. Set/Horus) and become the villian in the Age of Taurus (i.e. Ptah-Apis/Osiris). In this way, the ancient Kemetans deployed an array of multilevel thought that resisted simplistic interpretations and defies unidimensional renderings of their myths. It guards against the modern prediliction to label someone as “problematic” and therefore disposable. All mythic characters are vital and embued with meanings that can be viewed one way during one age, but another way in another age. 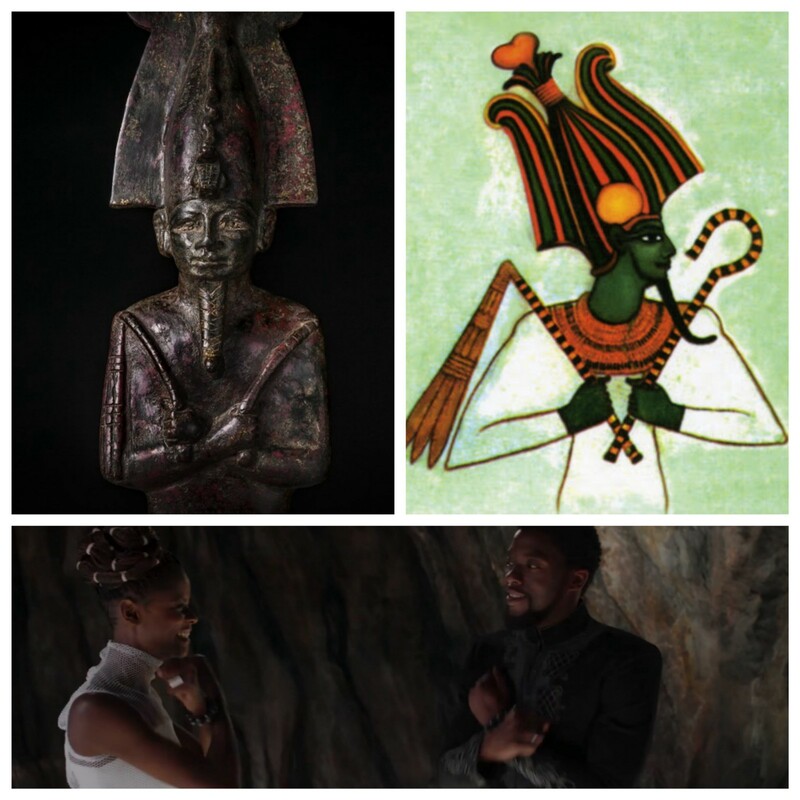 A clear visual marker that points toward the Osirian Drama is the way T’Challa crossed his arms on multiple occasions throughout the film. He does so in a particularly Osirian manner and I believe this was a very conscious decision. Black Panther screenwriters — Ryan Coogler and Joe Robert Cole — apparently remixed the Osirian Drama and in doing so they elevated the Black Panther story from a Marvel comic book story to the level of a more expansive and grand mythology that stretches back millenia to the Nile Valley Civilization at the northeast corner of the African continent. I have no way of knowing if this was a conscious decision or happenstance, but with such strong connections and the intelligence of filmmaker Ryan Coogler, I am heavily leaning towards the former. This post represents only the quickest attempt to lay out the idea that Black Panther is much more than a Marvel comic book story. In many ways, people can receive and perceive completely different things from the movie depending on which of the three levels of interpretive frameworks viewers are using to decode the film. It is also possible that these interpretive frameworks might shift over time with future releases of the Black Panther saga. Finally, the entire film emerges from an Afrofuturism impulse and sensibility. Wakanda is a sort of speculative fiction — a “what if” thought experiment — asking what would Black people be like without the imposition of European and Arab imperialism, enslavement, and colonization. Afrofuturism is perhaps the thread that ties all three levels of interpretive frameworks together. When the Royal Talon descends on the basketball courts of Oakland at the end of the movie, I saw the Mothership descending — that is, I witnessed George Clinton’s Mothership LITERALLY landing in the ghetto in a powerful way. 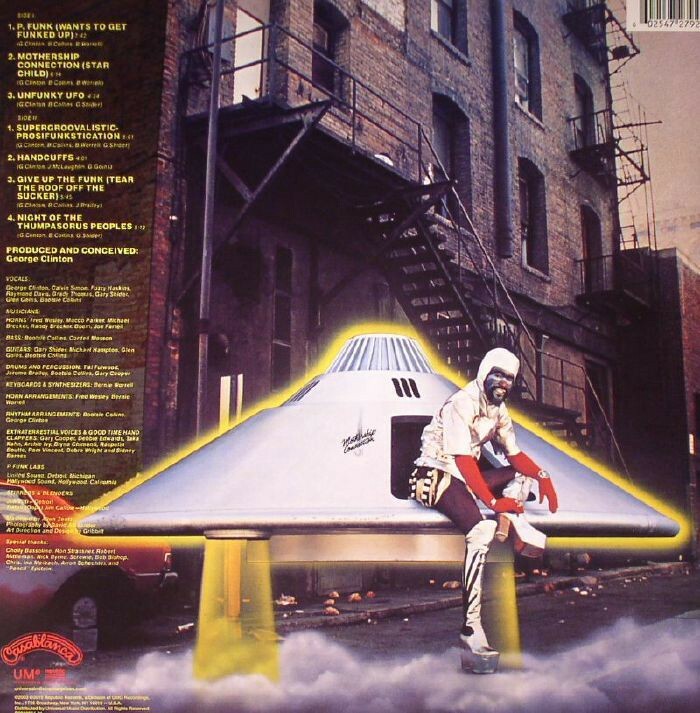 In fact, according to George Clinton, the title of Parliament’s seminal funk opera album Mothership Connection was originally Landing in the Ghetto! Coogler and Cole’s Black Panther is a transfixing and trans-African visual, aural, and emotional extravaganza that invites us to board the Mothership — an Afro-imaginary place to consider and contemplate the possibilities of where we have been, who we are now, and where we are going as a people. There are questions to be posed and discussions to be held…but truly, the Mothership has landed.